Beginning in May 2013, Princess Cruises will be positioning the 2,600-passenger Grand Princess in San Francisco year-round, the first time the line has homeported a ship there full-time. 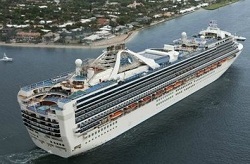 Grand Princess will sail a mix of cruises to Alaska, Hawaii, Mexico and the California coast - 10 day voyages to Alaska from San Francisco from May 10 to September 7, 2013; sailings to Mexico on a new 10-day itinerary that features stops in Loreto and La Paz in Baja California, Cabo San Lucas and Puerto Vallarta. The dozen Hawaiian cruises will be 15 days long and feature calls at Hilo, Honolulu, Nawiliwili and Lahaina; as well as a stop in Ensenada, Mexico. Departures will between October 4, 2013 and April 28, 2014. Recently renovated, the 1998-vintage Grand Princess now offers several new restaurants and snack spots (Alfredo's Pizzeria, the Crown Grill, and a specialty tea lounge called Leaves), a more fun "Piazza-style" atrium, a Crooner's Martini Lounge, and a new nightclub called "The One5." Many areas were also spiffed up, including the casino, art gallery, boutiques, buffet restaurant, Lotus Spa, and wedding chapel. The most unusual addition is the line’s first specialty tea lounge and library, called Leaves, offering a choice of up to 500 different tea blends presided over by a trained tea sommelier. The atrium space of Grand Princess has been completely rebuilt, combining a selection of quick bites, beverages, shopping and guest services. The new Vines wine bar has more than 30 wines by the glass, plus a selection of tapas and sushi as well as a wine shop where passengers can purchase their favorite bottles.